What a practical and compact card holder should be? At first, it has to be light and small enough for space. Second, the shape should be good fit to cards. When we receive the manufacturing project we also keep eyes on the above points that we have mentioned above for our customers. Specially, the sim card holder has more stringent quality standard than other general size products. Keep good materials thin as possible, and use an appropriate process to keep the shape nice and steady are our considering. Stamping forming is the common process for this kind of manufacturing that shapes flat products. Using with this process, parts can be produced at extremely high speed and the production of goods can be finished in a matter of minutes. Actually, there are several processes included the whole process, such as blanking, bending, cutting etc. 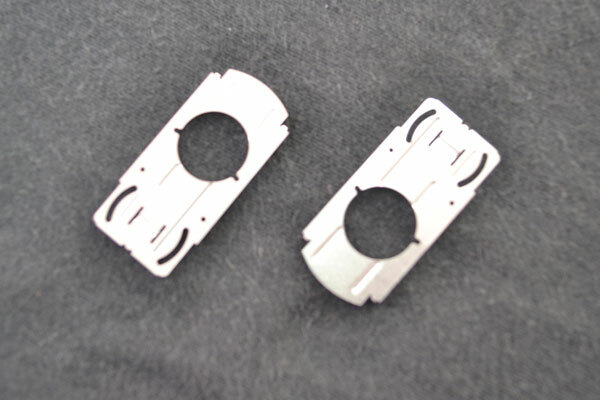 In this project, the stamped parts which used SS304 steel plate, were cut as 0.2 mm. This is a common stainless steel material in manufacturing industry and with a higher corrosion resistance. Since the smart card holder had nothing special requests of the surface design, choosing an easily accessible materials helps the custom stamping products significantly reduce overall cost. When the plate went through the forming die, the card holder was come out in second.